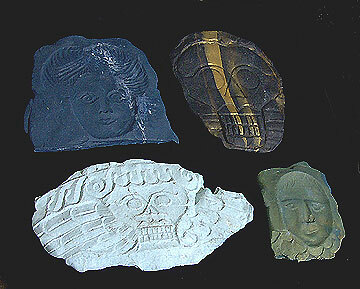 Many ancient gravestones and other items are either too fragile for repeated rubbings, or they are otherwise unsuited as art resources. When possible, I cast polymer clay molds from them. If you’ve worked with polymer clay in the past, you know that there are several release products that you can use to keep the clay from sticking to an object, including talc, cornstarch, and water. When casting from headstones, I use water. This protects both the stone and the clay. Before casting from any stone or other location, check local laws. And, use common sense. If the stone is very fragile or otherwise falling apart, don’t risk further damage to it. Supplies: I carry two water bottles (spritzer/spray bottles), one with distilled water and one with distilled water and a small amount of Shaklee’s Basic H in it. Basic H is a pH neutral surfactant; I add about two or three drops per pint of distilled water. You can use any similar product as long as it is pH balanced and used very sparingly, and it contains no fragrance or added color. It must be a pure surfactant. Carry plastic wrap and paper towels with you, too. You will also need polymer clay that you have prepared by kneading it or processing it through a pasta machine. I allow two or three packages of polymer clay for each small casting. The prepared sheets of clay should be at least 1/2″ thick, and 3/4″ is even better. And you will need a baking tray or other large, flat surface, to transport your cast, unbaked polymer clay. Optional: Clay molding tools. A basic flat edge with a beveled point is good, plus a gently curved tool. 1. Select a good stone for your casting. A “good” stone has fairly deep carvings and an interesting design, even if you can only capture a small area of it with your casting. 2. Clean the stone by spraying it with distilled water, and then wiping it down gently with paper towels. Or, if it’s a warm day, let the water evaporate. Repeat until the stone is clean enough to work with; generally, you’re only cleaning off residue from birds that sat on the stone. 3. If the stone’s carvings are distinct enough, drape a good sturdy plastic wrap (in the UK: cling wrap or cling film) over the area of the stone where you intend to work. If the stone isn’t suited for this, spray it thoroughly with distilled water, making certain to get plenty of water in the cracks and lines. 4. Immediately press the prepared sheet of polymer clay against the stone. Working from the back, press the clay firmly into the area you’re casting from. Then, smooth the back of the clay as best you can; if it’s too lumpy, it’s harder to use for rubbings later as it will rock slightly on your work surface. 5. Carefully peel the clay off the stone, or–if working with plastic wrap–carefully lift the wrap-plus-clay off the stone. Place the clay, design side up, on the baking tray for transport. 7. If you worked directly on the stone, clean the stone by spraying it with distilled water and a very small amount of pH balanced surfactant. Wipe it to remove any residue of the clay. Repeat as necessary until the stone is completely clean. Then rinse by spraying with the pure distilled water. Let air dry if the day is warm. Otherwise, dry the stone thoroughly. 8. Repeat for other stones, if you like. Then, carefully carry your cast designs back to where you can bake them. Care of castings: If you rub very heavily and/or repeatedly, these castings can crack and break. You can repair the breaks by gluing with white or wood glue. These castings will break if dropped, and with steady use you will see stress fractures. When the fracture is big enough, fill it with white glue and clean off the residue with a damp towel and/or a moistened cotton swab. Additional notes: In this process, I discovered something startling: The “negative” that is cast from a gravestone can sometimes produce a superior rubbing to the original, “positive” design. At the very least, it can be startlingly different. Below, the first image below is the positive image, the way it would look if you did a rubbing from the original gravestone. Below that image, you can see how different the rubbing is when it’s made by rubbing the mold that was cast from the original stone.